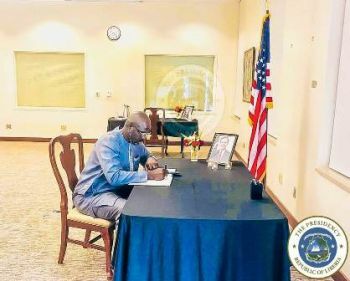 Monrovia, Liberia: President George Manneh Weah Tuesday, December 4, 2018 signed the Book of Condolence in honor of fallen former US President George Harvey Walker Bush. The Liberian leader, accompanied by an array of government officials, joined other Liberians to perform the solemn task as a mark of respect for a US President who was amply supportive of the Liberian peace process during his administration. “His contributions to humanity and peace building helped make the world a better place, and the people of Liberia are grateful for the leadership role he played in contributing towards peace and stability during our early days of turmoil,” the President said in a statement.